Intense and oppulent notes of black cherry and spiced red plum mingle with hints of anise spice and roasted coffee bean, showcasing the distinctive Chamisal spice. The pallet is rich and luscious with suggestions of macerated strawberry and blackberry, backed by fine and focused tannins that bring balance and length to the finish. 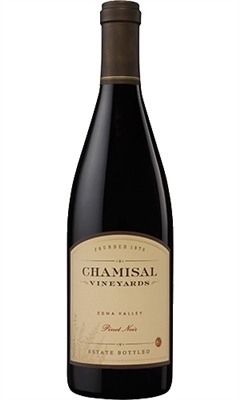 Chamisal was the first vineyard planted in the Edna Valley in 1973 and now contains 80 acres planted to 5 varieties and 25 clonal selections. The nearby Pacific ocean creates a long temperate growing season for exceptional hang time, which combines with the calcareous, clay-rich soil to produce fruit with exceptional intensity and complex flavors. 2013 started with a dry winter resulting in only 8.5 inches of rain. A warm February initiated an early budbreak and continuous warmer than average temperatures culminated in an early Harvest. Dry and consistently warm temperatures throughout summer and fall allowed grapes to hang until optimum ripeness. Overall, this was a stunning vintage with excellent balance. Our Pinot Noir was hand harvested from our estate vineyards at optimum ripeness and physiological maturity. After meticulous hand sorting, the grapes were destemmed with a small percentage left whole cluster. Each pick was fermented separately in small open-top fermentors. Fermentation was achieved using a combination of both native and cultured yeasts with low fermentation temperatures giving soft phenolics and fresh aromatics. After total fermentor time of 7 to 10 days, the wines were then racked to French oak barrels for ten months before blending and an additional four months in the barrel. This diverse blend of clones gives this wine its unique character and serves to show the terroir of our wonderful vineyard very clearly.